Rest & revive with an agritourism holiday on our tranquil, authentic, working farm where a warm Scottish welcome awaits from our 2 and 4 legged family. Savour the flavours of Angus before touring our farm, then explore the nature trails and find the hidden gems of Angus and beyond. We offer accommodation to make your stay as welcome and comfortable as possible. All our accommodation has been awarded VisitScotland 4 star so you can be assured of an excellent standard throughout and is further complimented by our VisitScotland’s Taste Our Best award for 2017/18 for the quality of our locally sourced food. Ideal for those wishing to escape to the country and enjoy the splendour of the rural environment but with easy access to the surrounding cities of Dundee, Perth, Aberdeen, and Edinburgh, all within an hours drive of Newton of Fothringham Farm’s central location. 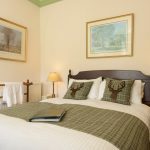 This also means it is well placed to enjoy many activities including shopping, visiting the new V&A museum in Dundee, hillwalking in the Angus Glens, golfing with 32 golf courses in the surrounding area, fishing, shooting, off-road driving and cycling. Glamis Castle, the childhood home of the Queen Mother is only 12 minutes drive and Dunnottar Castle to the North, 45 minutes drive. You may wish to stay with us in the main farmhouse where you can be assured of a warm welcome and a personal service where we currently have one ground floor family room ensuite which comes with many extras and thoughtful touches including free wifi. Staying in the farmhouse is offered on a per person per night rate and includes a Taste of Angus breakfast experience in our dramatic red and gold dining room where everyday feels like Christmas. We are pet friendly by prior arrangement. Please note we have our own friendly pets in the farmhouse. Chico our black Labrador loves guests and always gives a warm waggy welcome. He is especially good with children but please let us know in advance of your stay if you don’t wish his welcome. Chrissie our beautiful, petite cat is also very friendly and cuddly although she may choose not to make an appearance. Last year we extended the family with 2 puppies, a collie and a cocker spaniel, both working dogs but very friendly pets too. Alternatively, our three bedroom holiday cottage is just one field from the farmhouse and is available to book for self catering as it has a fully equipped kitchen, or for B&B, when breakfast is served in the main farmhouse. The B&B option, priced per person per night, is normally for groups of 3 or more guests or when the farmhouse family room is already booked but please check with us. Please note there is a two night minimum stay for the cottage, which is also child and pet friendly with an enclosed garden and a parking area next to the entrance. When self catering, this will be charged on a per week or part week basis with flexible entry days. 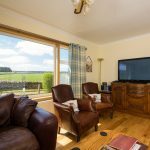 Newton Farm Cottage is the perfect choice to immerse yourself fully in peaceful, idyllic rural Angus but still have quick access to the cities and towns for exploring.